join Turk for an outing of your favorite fishing for walleye, smallmouth bass, white bass, and muskie! Wayne enjoying a Tuesday on the Mississippi River with a real nice walleye! The March and April ice cold high dirty Mississippi River flood waters are gone! Think Spring. Jig fishing is MOST of the time an instantaneous hookset upon feeling a fish. Why I Took Charlie “Turk” Gierke’s Walleye Fishing Course – Piece It Together Like a Pro by Joe Nesser. I am seventy years old. I have fished walleye in Minnesota, Wisconsin, the Dakotas, and Canada since I was five. Recent versions of the Outdoor News and Outdoors Weekly feature my "how to" fishing articles. Other articles have also been published in Midwest Outdoors, Fish and Game Finder, Minnesota Sportsman, North American Fishing Club and the Stillwater Gazette. Croixsippi Guide Service covers the St. Croix and Mississippi River waters from Stillwater, Minnesota down south to the Mississippi River town of Red Wing, Mn. Along this stretch the two rivers can be secluded and wild or built up with historic river towns and residences. The St. Croix and Mississippi Rivers boast eagles, herons, osprey, white tail deer and wild turkey. The St. Croix is also registered as a National Scenic Riverway. The sloughs and backwaters of these rivers are more remote than you may have imagined. I've lived near these two rivers my whole life - in Stillwater and now in Hudson, Wi. tackle fishing is very memorable. THIS IS A GAME FISH! White Bass deserve protection. Did you know this 18″ white bass is the biggest I’ve ever caught! I’ve caught thousands! White bass get 16 to 16.5″ DIME a dozen. A true measure 17″ is a monster whitie. "Turk" Gierke, owner/operator of Croixsippi Fishing Guide Service has served anglers of all skill ranges and ages for over 20 years. As a professional guide he is very committed to making each and every trip a success, and will do his best to make your trip all that it can be. Along with my fishing tournament partners - Scott Hale, Jason Hankes, Billy Mitchell, Kelly Bement - we have finished in first place ten times in St. Croix River walleye tournaments! Including five wins at the St. Croix’s largest fishing tournament, the Beanie’s River Rat contest. My sponsors are Rapala, Warners Dock, Everts Resort, and Limit Creek Rods. Most importantly, you should know that I am well prepared with the experience and drive needed to face the challenges that river fishing has - river currents, high water, and the constant changes that happen to the fish. Croixsippi is insured and licensed by the US Coast Guard to allow year round guiding for multi-species of fish. 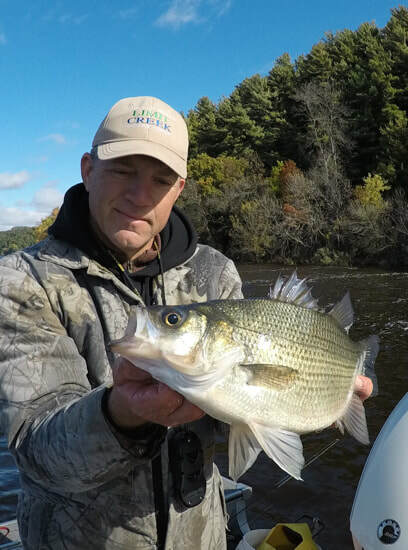 Warner's Dock provides friendly sales and service for boating and fishing enthusiasts throughout the St. Croix River Valley. World's leading brand of fishing lures. “Wounded minnow” swimming action that fish can't resist! Limit Creek Fishing Rods are designed to have the perfect balance between power and action. High quality, yet reasonably priced.